Today at work was pretty busy. I am glad that I can get my weights done in the gym at lunch time, when it is not super busy :) I am always super hungry after my workout so thats when I hook into one of my pre-cooked meals. I always take in some snacks for the day as well. 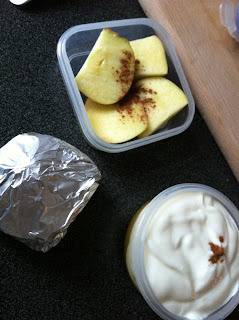 The usual suspects are apple & cinnamon, yoghurt & agave nectar & cinnamon and a protein muffin. People at work always walk past my desk and are amused by the fact that I always seem to be shoveling some kind of food into my face. What do you take into work for snacks or nibbles?